What are Single Level Domes? It would seem that routes with close clearances like tunnels, etc. would be off limits to the ultradome products, and that may be partially the case. But in addition to the two level dome cars, in the late 1990's Colorado Railcar introduced a single level variant. This could be in many ways one of CRM's most versatile products  an ultradome-like car that can go literally anywhere, any time. Overview  That million dollar ultradome view is the highlight of the single level domes, accomplished in a car that is compact, versatile and ideal for use on virtually any excursion operation. Like the double deck cars, the single level domes feature the massive 6 foot by 7 foot dome glass windows, and are equipped with four emergency exit windows, two of which are visible in the above the photos (the first two windows with the extra framing). In terms of construction to date, the single level domes have exhibited a little bit more variety. The first car constructed was actually the last (as of Oct., 2003) to enter revenue service. That car - ARR 2000 - is now the pride of the Alaska Railroad fleet. It features lounge seating, and is available for lease service. It is also the only single level dome to be built with an observation platform. The platform car, originally numbered 9005, was built as a demonstrator car, and achieved its intended purpose of attracting an order for cars for the Florida Fun Train, a short-lived but innovative train the utilized four single level domes as well as four hollowed out SP bilevel cars that were used as restaurant, arcade and theater cars. The 9005 was never used due to concerns over liability with the open platform. All nine cars were sold to Alaska Railroad in 1999. Construction of three other cars was halted by the Florida Fun Train shut down. A year later, BC Rail ordered those three single level domes  one intended for service behind the Royal Hudson steam engines, and two for its new Whistler Northwind luxury service between Vancouver and Prince George, BC. All three ultimately ended up on the Northwind, but were sold to VIA in late 2002 when BC Rail ceased all passenger service. 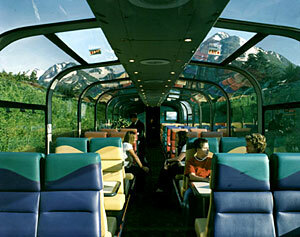 The trio now comprise VIA's Panorama car class, and provide the Totem Deluxe class on the Skeena train between Jasper, AB and Prince George, BC. Features  There has been quite a bit of variety thus far in single level dome cars. The 9005, remodeled by Alaska Railroad and operated as the ARR 2000, operates in a business car configuration, with small galley and lounge type seating. The other ARR cars feature four top table seating, while VIA (ex-BC Rail) 1721 and 1722 feature standard coach seating. VIA 1720 has the coach seating, with the addition of a small galley. The single level domes aren't far behind their double decker brethren in terms of air conditioning  36 tons compared to 40 on the ultradomes. And yes, all that a/c gets a workout keeping the car temperatures at a comfortable level, even though the glass features five layers of tinting and a 62 percent reduction in solar gain.